The public protector’s report has found that Jacob Zuma disproportionately benefited from the upgrades made to his home by an estimated R246-million. President Jacob Zuma unduly benefited from “exorbitant” upgrades to his Nkandla home and must pay back a reasonable portion of the costs to the state, according to public protector Thuli Madonsela’s findings. In a damning report released on Wednesday, entitled “Secure in comfort”, Madonsela also found Zuma had contravened the executive ethics code because he failed to stop the spiraling costs of the upgrades, as is his duty as a member of the Cabinet. Madonsela said the cost to be paid back should include some items, which were not “accepted as” security features. Madonsela received seven requests to investigate Nkandla in 2011 and 2012. She was later asked to investigate whether Zuma lied to Parliament in 2012 when he said that his family had paid for the construction of Nkandla. 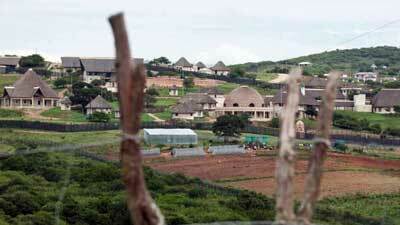 Zuma also said the state had not built any parts of Nkandla for him and his family. “This was not true. It is common cause that in the name of security, government built for the president and his family a visitor’s centre, cattle kraal and chicken run, swimming pool and amphitheatre. The president and his family clearly benefited from this,” said Madonsela. But Zuma told her that, while he was addressing Parliament, he was not “thinking about the visitor’s centre”. Madonsela found that Zuma was aware of the scale and cost of the construction at Nkandla throughout and that he should have taken steps to stop the escalating costs. Instead, Zuma regularly complained that the upgrades were not happening fast enough. A cloud of controversy has surrounded the more than R206-million allegedly used for what was described as security upgrades at the Nkandla residence in KwaZulu-Natal. In November, the Mail & Guardian reported that Madonsela had found in her preliminary report that Zuma had misled Parliament and benefited substantially from the upgrade. An inter ministerial task team report on the Nkandla expenditure was released in December, after it was declassified, confirming that a total of R206 420 644 was spent on the upgrade. Public Works Minister Thulas Nxesi, who initially classified the report, said at its release that allegations that Zuma had used state resources to build and upgrade the residence were unfounded. The report’s release date was expected to be around February 9, a few days before Zuma’s State of the Nation address, but Madonsela extended the deadline for responses at the request of one of the parties. Madonsela has been criticized by the ANC for her handling of the probe, with the party’s secretary general Gwede Mantashe accusing her of trying to “muddy the waters in the election campaign”.